Dan and Nick Gilbert celebrate their #1 draft pick. Every year, when the NBA has to decide who gets the top draft pick, they turn to a series of ping pong balls, each weighted according to the odds that it will come to the top of the machine. Obviously, it’s a strange system, but there we are. It keeps teams from taking too hard in an attempt to get the top draft pick, and it keeps things interesting for those teams that qualified for the lottery but weren’t abysmal. The Orlando Magic had a 25% shot at winning the draft lottery; instead, they’re picking second. 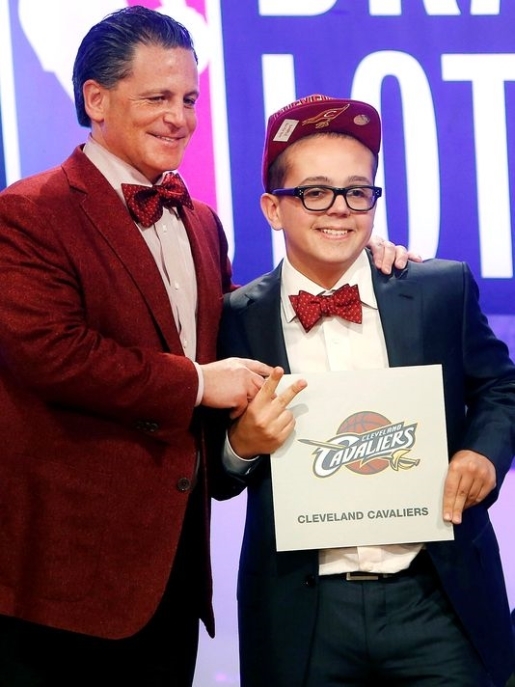 The Cleveland Cavaliers landed the number one pick in the NBA Draft, using owner Dan Gilbert’s son Nick Gilbert as a lucky charm. This will be the third time in 11 years that Cleveland has landed the top pick in the NBA Draft. Those picks have panned out thus far, with both LeBron James and Kyrie Irving making their way to the team. The third pick, expected to be Kentucky center Nerlens Noel, will be a great addition to a young team.